This might be one of the most beautiful colors I've ever seen. You can't even get the full effect of it in jpeg form, because all that gold is actually shiny, beautiful foil. Besides that, the intricacy of the design is just stunning. A cover like this could easily be busy in other hands. However, the use of a very limited palette, just a few quite similar shades of gold on black, turns it from something dizzy into something striking. Plus, that font! I can't wait until my copy arrives. Mayday Parade is a favorite from my screamo days. I adore this cover of "In My Head" by Jason Derulo. They somehow have turned a peppy club song into an emotional 90s angst anthem. Which I totally love. Listen to that pathos! SO PRETTY! This book is going to look so shiny in real life. 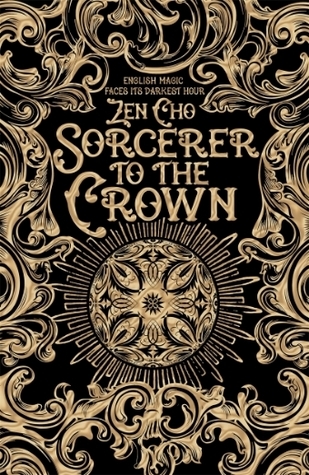 I love that it screams fantasy but isn't the traditional cover you see a lot in the genre. I'm a fan. I KNOW! I can't wait to see it. I think the uniqueness definitely adds to the appeal.